Other Victims Of Arizona Rampage Move On Without Letting Go : The Two-Way "I can think about it now without sobbing," says Suzi Hileman, who was wounded in the shooting rampage that left six people dead and 13, including Rep. Gabrielle Giffords, injured. Others who survived or lost loved ones are also finding ways to cope. 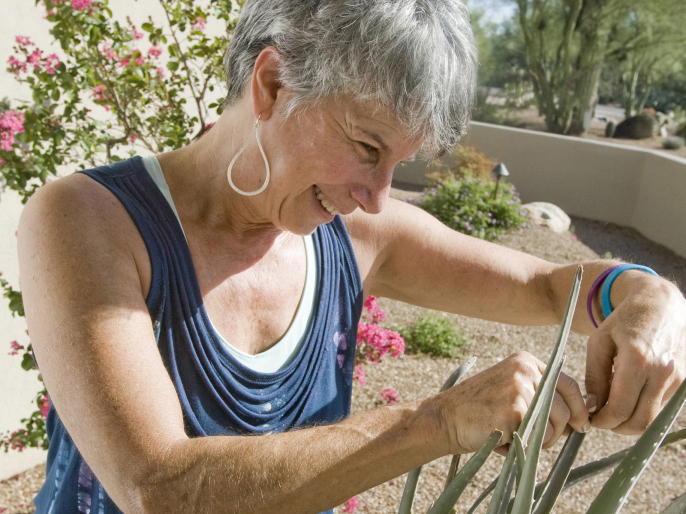 Suzi Hileman inspects an aloe on her front porch on Wednesday, Aug. 24. We've heard from Rep. Gabrielle Giffords (D-Ariz.) in recent days about her slow recovery from being shot in the head on Jan. 8. 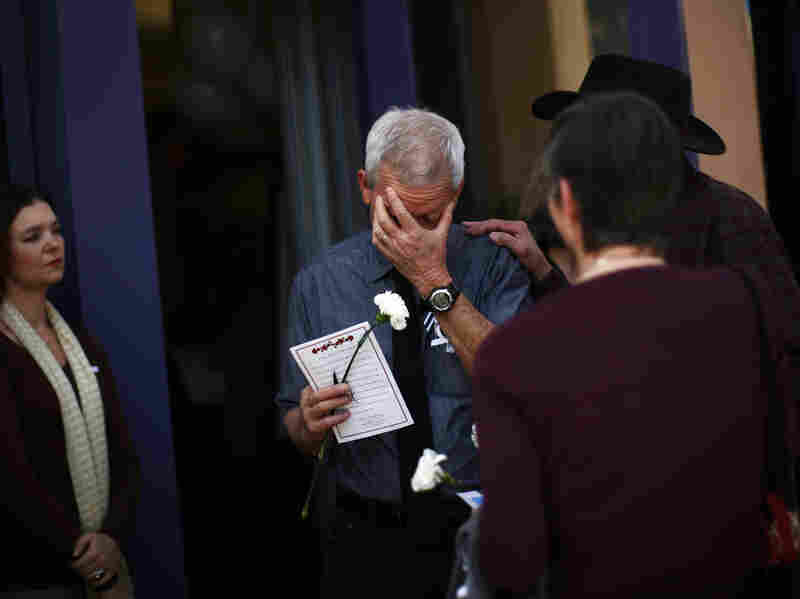 There were 18 other victims of that day's shooting rampage in Tucson — six of whom died. And beyond them, there are dozens of family members and loved ones in pain about what happened. On All Things Considered today, three of those people share their stories. NPR's Ted Robbins profiles Ron Barber, Suzi Hileman and Ross Zimmerman. Each talks about what it's been like to move on from something they can't ever really move away from. Barber was shot in the face and thigh. Physically, he's much better. In July, he returned to work half days as Giffords' congressional district director. There's a small scar on his cheek and one of his legs is still numb. But Barber "still has nightmares," Ted reports. "I'll never forget what I saw that morning," Barber says. "Seeing Gabby shot and seeing Gabe [Zimmerman, a Giffords aide] die ... those two images are just seared into my head." Being back at work has helped him move on, says Barber. But, "it's bittersweet ... every day I'm here I'm reminded that Gabe is not here." Hileman had taken a 9-year-old neighbor, Christina-Taylor Green, to the event Giffords was holding at a Tucson strip mall that day. They were both shot. Christina-Taylor died. Hileman's hip was shattered. Now, gardening provides her with some comfort. "I take these flowers," she tells Ted, "and I put them in and the soil feels good and it's living and it's going to grow and get bigger and life goes on." "I'm here. The sun is out. I'm having an interesting conversation [and] doing something that I love." But then, "I remember January. It comes and bites you. It jumps up. ... My friends lost their daughter. ... I don't know what to do about that. I don't know where to put that and I don't know that I ever will. But I can think about it now without sobbing." Ross Zimmerman, father of Gabe Zimmerman, mourns at his son's memorial service in Tucson, Arizona Jan. 17. Zimmerman — 30-year-old Gabe's father — is the most pragmatic of the three, as Ted says. "I don't like it one little bit," Zimmerman says of losing his son. "I would do anything to roll all that back." But at the same time, says Zimmerman, "it's not like there's anything I can do about it. ... I got a dead kid, [so] what do I do? I keep moving forward. That's what Gabe would prefer." Click here to find an NPR station that broadcasts or streams All Things Considered. Later today, we'll add the audio of Ted's report to the top of this post.